Silver has been used in jewellery making for more than 4000 years. As a precious metal it will always have that timeless feeling to it. Therefore, it is no surprise that the majority of the magical and Norse Trollbeads are created in silver. The tradition goes back to the Viking era where silver jewellery had its first momentum in Scandinavia. The great Vikings of the North created lots of silver jewellery, including armrings and necklaces. Trollbeads are little pieces of art, made with a blend of new and ancient technique. 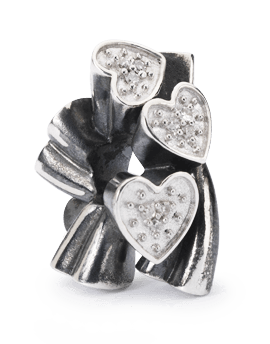 Trollbeads are produced in Sterling silver, consisting of 92,5% pure silver and 7.5% other metals, primarily copper. Therefore, all Trollbeads silver beads are stamped with the hallmark “LAA 925s”. 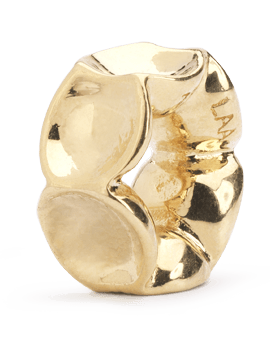 LAA stand for Lise Aagaard, and 925s is a guarantee given by the company that the material used is 92,5% Sterling silver. If silver was used without the addition of other materials, the silver would be too soft for jewellery. Furthermore, it wouldn’t oxidize. Trollbeads Sterling silver beads are all finished by hand and filled with beautiful and quirky details. Some designers prefer to design in wax, others are fonder of newer techniques, like on a computer. 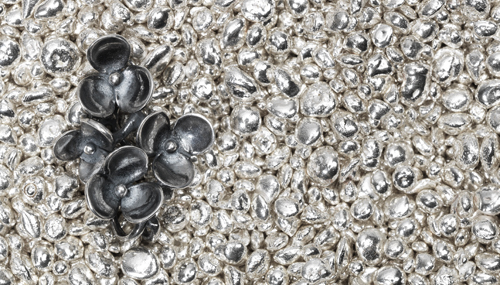 After design, all silver beads are crafted by the 3,000-year-old technique ‘cire perdu’ or ‘lost wax’. This method allows for fine details to be reproduced from wax to precious metals. When designing a silver bead by the cire perdu technique, the design is first sculptured in red wax. Hereafter a plaster model of the sculpture is made. Silver granules are then heated in a small bowl, melted and poured into the plaster cast, filling out the model nicely. When the silver has solidified, the plaster is submerged in water, resulting in the plaster to disintegrate and the silver figure can be removed. At this point, the figure is completely black. It is then dipped in an acid bath and turns white. When the silver bead has cooled off, it is rinsed, renovated, polished. Trollbeads use oxidization for our silver beads to create contrast effects and to give them character. Any piece of jewellery will oxidize if it lies in a box for years. Our process of oxidization is just like the natural tarnish process that air has on silver, but we accelerate the process. Oxidization adds new design possibilities and enables the designers to give the beads a unique look and a lot of depth. The silver beads are dipped in an oxidizing solution, which turns the bead black without damaging the surface. The black deposit is then polished off in a tumbler except in the folds and corners where the polisher cannot reach. 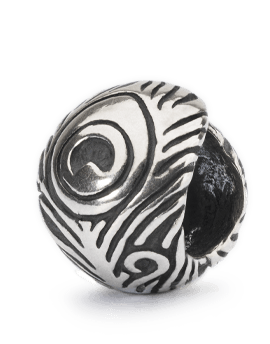 The surface of the bead is left shiny with dark corners, giving the beads character and the signature Trollbeads look... Voilá: A new bead is born. Not surprisingly, glass has been surrounded with an air of mysticism since it was invented thousands of years ago. There is something magical, even supernatural, about the transparent material that starts out soft and malleable at high temperatures and becomes harder than metal as the temperature falls. And there is something undeniably enigmatic about the finished glass figure that as a massive form yet has a transparency that is almost fluid. Introduced in 2001, the glass beads became a colourful and mesmerizing addition to the Trollbeads collection. Traditionally glass beads used in jewellery stood alone. Therefore, combining the vivid material with gemstones, gold and silver, was highly innovative. Glass is magical compared to other materials; it starts out soft at high temperatures and becomes harder than metal as the temperature falls. All Trollbeads glass beads are handmade from red-hot glass in the open flame. Most of the Trollbeads glass comes from Italy. It is imported from Murano, an island close to Venice in northern Italy. 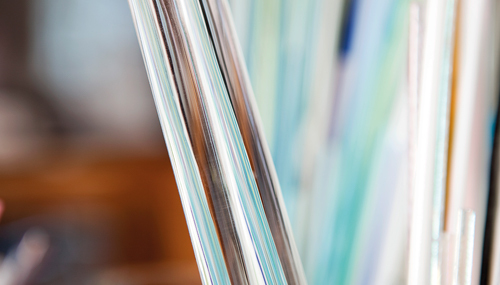 For centuries high quality glass has been produced here, and the Murano glassblowers are also some of the world’s most accomplished glass artists. Technically, glass is a combination of chemicals. Silicon dioxide is the main component. The silicon dioxide is usually derived from quartz sand while other components, such as sodium oxide and calcium oxide, are derived from soda and potash. The colour of the glass is also dependent on the substances added to the glass during manufacture. For example, a clear marine blue colour is achieved by adding copper. Making glass beads demands patience and precision. Compared to metal glass is very different to work with. You cannot control glass like metal, which you can hammer, pull and stretch. When the glass melts, it rolls itself into a ball due to the natural surface tension, which is comparable to the tension that causes a drop of water on a surface to become round. Every colour reacts differently, and the designer can exploit this knowledge to create a variety of designs. Glass melts at some point between 600 and 800 degrees, depending on the colour. Different colours melt at different temperatures. Some raise to the surface of the bead and some sink to the core of the bead. Working with glass allows for playing with depth and dimensions. Exploiting different colours in different layers of glass leaves many great optical illusions and a sense of depth. The many glass beads in the collection are decorated with flowers, patterns, bubbles, stripes, gold and silver layers and much more. Some of them are even faceted with 126 handmade facets. It is soft, heavy and alive in its own way. The colour is amazing and even if it has been lying for 500 years in an old shipwreck at the bottom of the sea, it does not lose its magnificent and radiant shine. For thousands of years it has been the ultimate symbol of power, wealth and divinity. Yes – we are talking about gold! Through time, jewellery and other decorative objects made in gold have been found in innumerable royal tombs belonging to Sumerian emperors and Egyptian pharaohs. The fascination for the enduring gold is unreduced today and the demand for gold Trollbeads continues to increase. There were already 200 silver beads in the collection at the time when Lise Aagaard decided to make the first bead in 18 K gold. The gold bead was sold within one week. Since then the gold beads became a permanent part of Trollbeads’ collection. The nobility and purity of gold is measured in carats. Pure gold is 24 K. Usually gold is mixed with copper, which allows for a warm, golden colour. 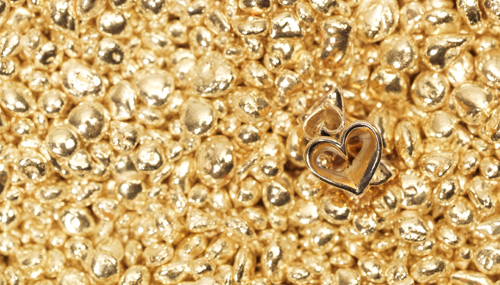 For all our gold beads we use 18 K gold – the perfect balance of purity and strength. The foxtail bracelet and necklace is made of 14 K gold. The gold beads are stamped with the hallmark LAA 750. This means that 750 units out of 1000 are pure gold. Each gold bead has its own price, which is determined by weight. Gold Trollbeads are made by the same technique as our silver beads. They are carefully crafted by hand, mostly by the 3,000-year-old technique ‘cire perdu’ or ‘lost wax’. This method allows for fine details to be reproduced from wax to precious metals. The process starts by sculpturing the design in red wax. Hereafter a plaster model of the sculpture is made. Gold granules are then heated in a small bowl, melted and poured into the plaster cast, filling out the model nicely. When the gold has solidified, the plaster is submerged in water, resulting in the plaster to disintegrate and the gold figure can be removed. When the gold bead has cooled off it is rinsed, renovated and polished. Beads that are combined of both silver and 18 K gold are called two-tone beads. They are stamped with LAA925s, because the hallmark is based on the metal of lowest value. In this case silver. Making a two-toned bead involves more craftsmanship than creating a bead in just one metal. Therefore, these beads are more expensive. 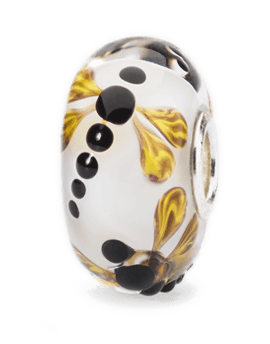 Gold or silver leaves are encapsulated in several of our glass beads. These leaves are made of pure gold or pure silver. By hammering or rolling the metal, it is reduced to a thickness of less than 0.001 mm, which makes it easier to work with in combination with glass. Born under enormous pressure since the dawn of time, pieces of raw rocks are dug out of the crust of the earth and made into exquisite jewellery of timeless beauty. There are many stones in the Trollbeads collection. Apart from their sparkling beauty, each individual stone has meaning and significance. Rose quartz opens your heart. 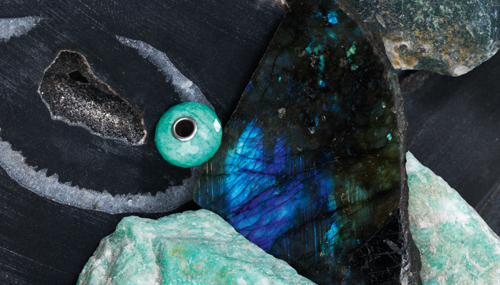 Labradorite attracts strength and perseverance. Obsidian helps you to let go of feelings of anger and sorrow. Trollbeads only work with natural gemstones of the highest quality possible, and this is what makes Trollbeads gemstones unique. 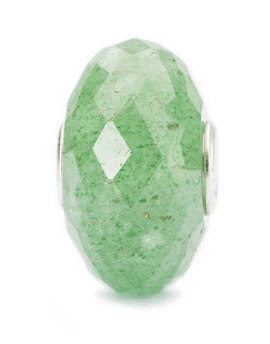 Due to natures very own design, the stones will vary in colour and have unique inclusions and features that show their great age and natural beauty. You will never find two identical stones. The gemstones used in the Trollbeads collection are carefully selected based on where the best raw materials can be obtained. The same stones might be found several places in the world, and the colours will vary from one deposit to another. We always look for the brightest and most interesting colours and combinations of colours. When making gemstone beads, a small chunk of the natural stone is sanded by hand on a sanding wheel. As the stone is sanded into the right size, it is also being rounded, and the hole in the middle is drilled with a diamond drill. Most of Trollbeads gemstone beads are facetted with 154 facets - all made by hand. At last, the silver core is mounted in the middle. Unlike any other jewel, which is dug out of the earth and then cut and polished, nothing must be done to bring out the inner beauty of the pearl. Pearls are what they are. Moonlight caught in the tears of mermaids. 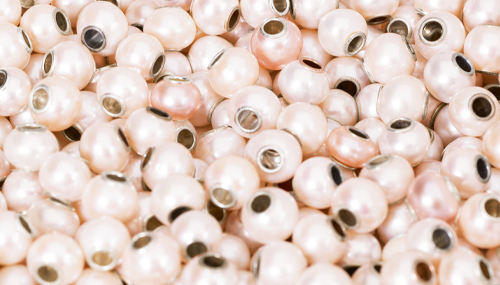 The shiny and beautiful pearls are often referred to as the jewels of the ocean. They are truly one of nature’s most amazing wonders and a mysterious and captivating feel surrounds them. In the Middle Age, it was only the royals and the nobility who were allowed to wear them, and pearls have since then become a symbol of wealth and perfection. It is said that pearls can be a symbol of tears, but that can only be for those who don’t own any. Fresh water pearls are a natural consequence of mussels living on a sand bank of lakes, rivers or creeks. 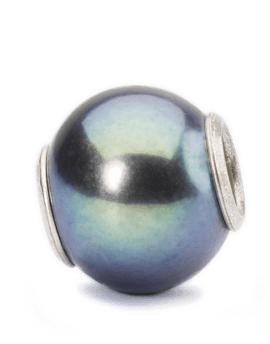 The Trollbeads pearls are freshwater cultured pearls. For the pearls to gain the correct shape, they grow and develop inside a mussel for four to five years. The process starts when a tiny scrap flake from another mussel is placed inside the mussel. Over time, the mussel will cover it with mother-of-pearl, turning it into a beautiful pearl. 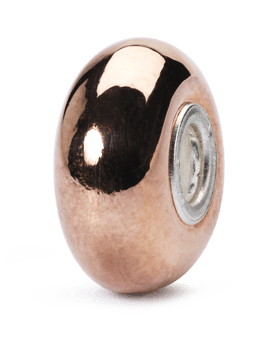 The colour of the pearl is defined by both the external conditions, the outside colour of the mussel, and the structure of the mussel. Pearls are truly nature’s magical wonders. As the pearls are perfect already when found in nature, we do not do much to these little wonders to prepare them for sale; A specialized robot drills holes in the pearls, ensuring that the process does not fragment the pearls. When the pearls have the correct sized hole, every pearl is fitted with a silver core. This is done by using a special tool to ensure that the silver core is placed with care and precision for each individual pearl. 50 million years on the way to your bracelet. It is almost incomprehensible how long ago that is, but that specific moment in time is what we see. A ray of sunlight caught in a piece of amber and fitted with sterling silver. 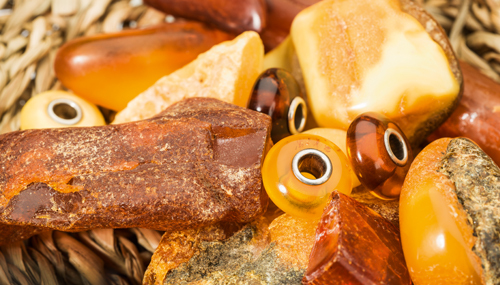 Since ancient times amber has been cherished for its beauty, its stunning colours and its spectacular history. Amber is also known as the Nordic Gold. You can find amber all over the world, and the occurrences are slightly different dependent of age and tree sorts. Most of the Trollbeads amber is from the Baltic Sea. Throughout history, from the Stone Age and throughout the Bronze Age, amber has been especially popular in jewellery and amulets for good lucks, and it has even been used in medicine. Around the world, there are different meanings connected to amber and many places it is said to bring happiness, good health, and prosperity. The Vikings believed that amber was the tears of the Norse goddess Freya, who was, among other things, the goddess of love, fertility, and gold. According to a Chinese myth, amber is the souls of dead tigers, which has made it a symbol of courage. Amber is an organic material made from fossilized tree resin, which comes from pine trees. When the stem of a tree is damaged, resin will seep from it and eventually end up on the forest floor. Over time the resin hardens and after several million years it turns into the material we know as amber. The composition, colour, and other characteristics of amber vary according to age, sediment conditions, and the type of tree the resin comes from. The colours of amber range from light cognac to dark cherry and even black, and from milky to antique. Green and blue amber can also occur. You can find both transparent and opaque amber. The weight of the amber is very low, and amber travels with the seaweed. In stormy weather, the waves bring the amber from the seabed, and wash it up on the beaches together with seaweed, pieces of wood and mussel shells. So, the best time to look for amber on the beach is after a storm. Besides washing in by the sea, amber is also found hidden in the ground. Amber’s mineral hardness is just a little harder than a fingernail. Due to its softness, it is of great importance that the artisans working with this material are truly skilled and gentle. Inclusions in amber are small insects or plants that were caught in the sticky resin millions of years ago. 80% of the insects are flies, mosquitoes and ants, but in rare cases small spiders can also be found. You are very lucky if you find a piece of amber with an inclusion inside. The fossils found in amber are three-dimensional and are therefore considered to be the best-preserved evidence of early life. You could say that amber is a window to our past. 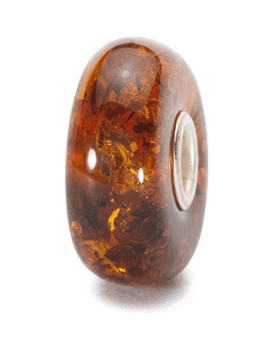 The first step of creating the amber bead is done by nature when the small pieces of amber are shaped by roughly sanding the edges and making the amber rounder. Hereafter, all Trollbeads amber beads are delicately made by hand. Each bead is individually sanded, shaped, and polished. Then a small hole is drilled in the centre of the roughly shaped amber, and through many steps skilled jewellers are now making it into a beautiful bead, carefully using small and delicate tools. Finally, it is time to insert the silver core and now the bead is ready to shine on your bracelet. Copper is believed to be the first metal used to make jewellery. In its stunning beauty, copper is a great element with unique abilities. It is known to strengthen your health and balance your body. Copper is especially known as the metal of love. It is also known for bringing positivity and good luck to your life. It helps you embrace and understand your inner energies and balance your chakras. Copper is one of the 118 chemical elements and in contrast to e.g. silver and gold, Trollbeads uses copper in its pure form. 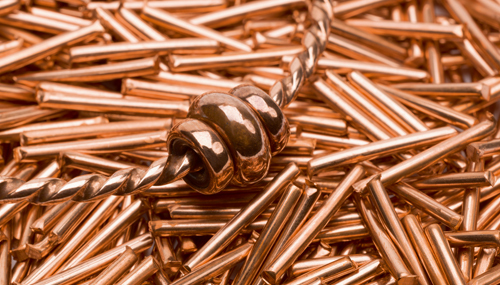 Copper is a beautiful metal ranging from a gentle reddish/brown to a darker red colour. Copper can be found directly in the ground. Today, most copper is cultivated from great copper mines where ores rich on copper sulphides are extracted and refined into beautiful copper thread. Pure copper has an amazing red/brown colour that shines like a warm embrace. When copper gets in contact with air and water, a chemical reaction occurs, and the copper will start to oxidize, which means that it will start turning into a dull green colour; this is called patina. As an example; it took the Statue of Liberty 25 years to turn from bright and shining red to her now characteristic green colour. When we make our characteristic copper beads, it is done with the same technique as we use when making our Sterling silver and 18 K gold beads; the ‘cire perdu’ or ‘lost wax’ method. The process starts by sculpturing the design in red wax. Hereafter a plaster model of the sculpture is made. Copper granules are then heated in a small bowl, melted and poured into the plaster cast, filling out the model nicely. When the copper has solidified, the plaster is submerged in water, resulting in the plaster to disintegrate. At this point, the small copper sculpture is completely black. It is then dipped in an acid bath, which makes it turn pink. When the copper bead has cooled off it is polished and is now ready to shine on your bracelet. Diamonds are forever – a saying that symbolizes an everlasting love. A diamond has become the way of expressing your undying love to your one true love, and because a diamond is close to unbreakable it is the perfect symbol for a love that cannot break. Diamonds have had many meanings and positive attributes through history. It is said to bring its wearer great strength, and even Julius Caesar, Louis VI and Napoleon had the diamond as their talisman. The diamond also represents truth as it is believed to hold great power and a connection to spirituality. They are believed to improve your energy, prosperity, your love life and give you faith. Diamonds are the hardest naturally occurring mineral. They are formed under enormous pressure and high temperatures. Most natural diamonds have been dated to be more than 1 billion years old. The hardness of the diamond depends on the purity of the diamond. This means that the hardness of a diamond increases in relation to if it has fewer flaws and higher purity. When cutting diamonds into beautiful and intriguing shapes, nothing but other diamonds are strong enough to cut it. The most popular way to cut a diamond, is the brilliant cut. This specific cut is based on a mathematical analysis ensuring the most rays of light to pass through the diamond making the diamond sparkle and shine. Not two diamonds are the same, as they differ in size and cut, making the process of fitting the diamonds into our beads a unique process for each individual diamond. The diamonds are inspected one by one, and the holes are made individually for each diamond. Then they are fitted into the bead by hand. This is a time-consuming process, as everything is done by hand and with no diamond being exactly the same, it makes it difficult to standardize the process. Cubic zirconia is a beautiful manmade gemstone. In the 1970s the demand for diamonds increased, which made the jewellery industry look for an alternative. Cubic zirconia was originally developed for the laser industry, and it was not until the early 80’s that people started noticing the potential of the cubic zirconia, as it looked very similar to diamonds. Today cubic zirconia is used in jewellery all over the world, giving the luxurious feel of a diamond without having to pay the high price. Cubic Zirconia is the most perfect simulated diamond and is a mix of zirconium oxide powders, magnesium, and calcium. 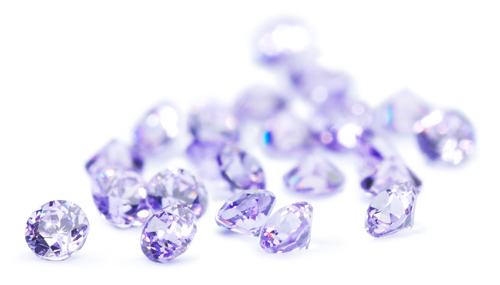 Cubic zirconia is slightly heavier than a diamond but not quite as hard on the hardness scale for gemstones. The cubic zirconia can be cut in the same shapes as a diamond, however, when looking at a cubic zirconia, you can see more flashes of colour reflecting from the stone, than you can see when looking at a diamond. 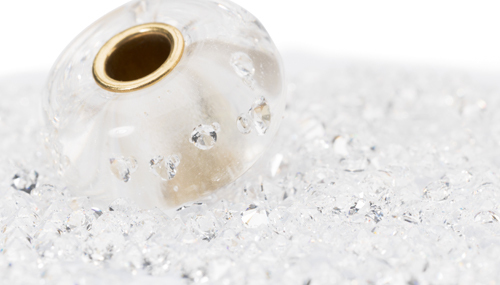 Our glass beads with zirconia are handcrafted and carefully detailed and designed. Once the red-hot glass has been heated over the flame, a small layer of glass is formed on the mandrel and then the zirconia is carefully placed on the hot glass. 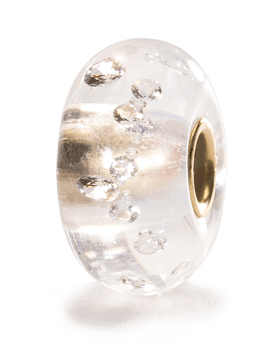 Once all the zirconia is placed on the bead, a layer of clear glass is rolled on top, encapsulating the beautiful stones in it. By using clear glass on top, you can still see the zirconia and you still benefit from the beautiful and encapsulating way the rays of sun play and reflects in the zirconia, giving the bead a beautiful shine and unique life whichever way you turn it.